Later this year we'll see Anton Corbijn's recent adaptation of A Most Wanted Man, featuring one of the final performances from the late Philip Seymour Hoffman (read my review from Sundance here). 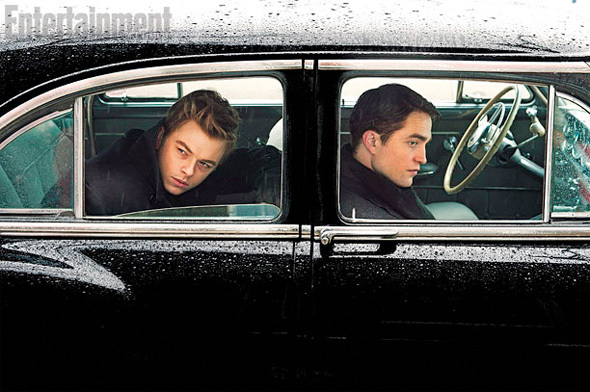 But right now the director is working on a much different project, focusing on the real-life relationship of James Dean (Dane DeHaan) and photographer Dennis Stock (Robert Pattinson) in the film Life. Now we have a first look photo of the two young stars in the film that follows Stock as he meets Dean, shooting photos of him around the country, and slowly coming out of depression due to regret for being an estranged father. Life is directed by Anton Corbijn (The American, A Most Wanted Man) and written by Luke Davies. The film follows photographer Dennis Stock (Robert Pattinson), who feels guilty as an estranged parent to his son. But after meeting James Dean (Dane DeHaan) in 1955 before the premiere of East of Eden, Stock slowly comes out of his funk after spending time with the actor in Los Angeles, New York, and Indiana, having been commissioned by Life Magazine to photograph the future short-lived superstar. Ben Kingsley and Alessandra Mastronardi also star in the film which will see release sometime in 2015. Looking good? Wow. He looks similar to DiCaprio when he was younger. Still will never win an oscar. Haha...They are making him work for it, aren't they? He will get one eventually though. I wonder if this movie is gonna bring up that old myth of James Dean being gay in this. That would be pretty interesting in my view.